To integrate Pitest, we’re simply adding the following plug-in to our project’s pom.xml. 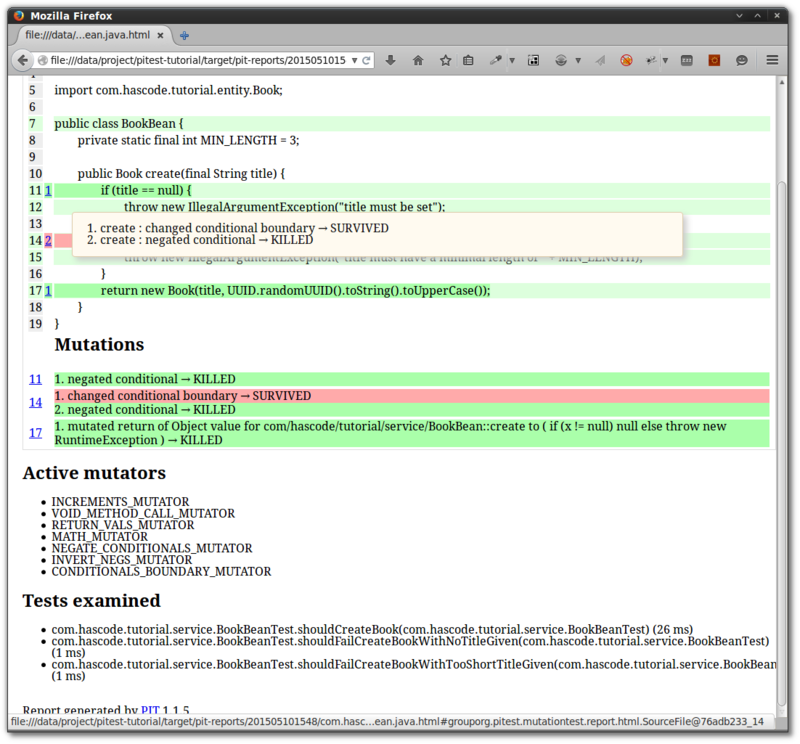 In addition to write some tests, we’re adding junit and hamcrest-all to our project. We may specify a pattern for classes to be mutated and tests to be used by adding the following lines to the plug-in definition in the pom.xml. If nothing is specified, the project’s groupId is taken as a default. More detailed information about the other configuration flags can be found in the documentation here. Another POJO, creates new Books, adding an unique identifier and checking some constraints. A simple test, verifying the book bean’s behaviour for the success path and two possible error paths. 3:48:50 PM PIT >> INFO : Verbose logging is disabled. If you encounter an problem please enable it before reporting an issue. \3:48:50 PM PIT >> INFO : Calculated coverage in 0 seconds. 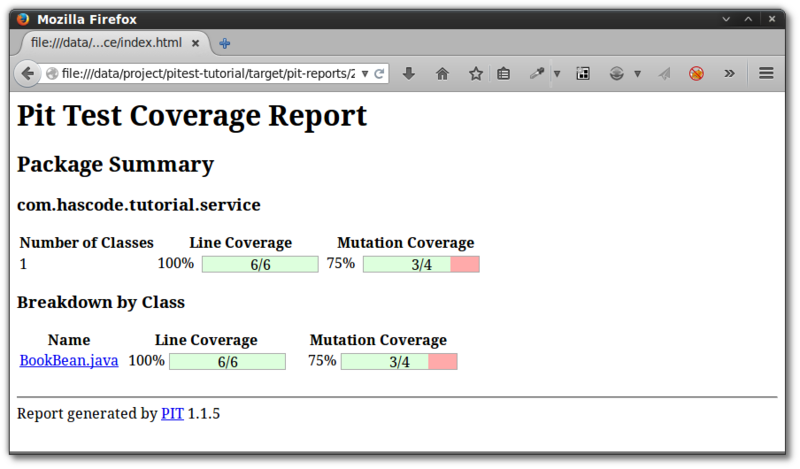 Now we’re ready to have a look at the generated HTML report of the mutation test in target/pit-reports/yyyyMMddhhmm. This entry was posted on Sunday, May 10th, 2015 at 2:30 pm	and is filed under Java, testing. You can follow any responses to this entry through the RSS 2.0 feed. You can skip to the end and leave a response. Pinging is currently not allowed. I’m trying to get PITest to run on my project in IntelliJ using Maven. I kept getting errors saying that there were no tests run. 9:26:02 PM PIT >> INFO : Verbose logging is disabled. If you encounter an problem please enable it before reporting an issue. 9:26:02 PM PIT >> INFO : SLAVE : b4e0). One of the two will be used. Which one is undefined. 9:26:02 PM PIT >> INFO : Calculated coverage in 0 seconds. [ERROR] Failed to execute goal org.pitest:pitest-maven:1.1.5:mutationCoverage (default-cli) on project pitest-tutorial: Execution default-cli of goal org.pitest:pitest-maven:1.1.5:mutationCoverage failed: No mutations found. This probably means there is an issue with either the supplied classpath or filters. [ERROR] See http://pitest.org for more details. While it leads me to believe that I have something wrong on my side, I wanted to see if there was something simple that you might know about since it happened when I tried to run your program also. Thanks for any help. Even if you are unable to respond or if you do not see anything wrong, I think your article is leading me closer to finding the problem. So I found the problem. 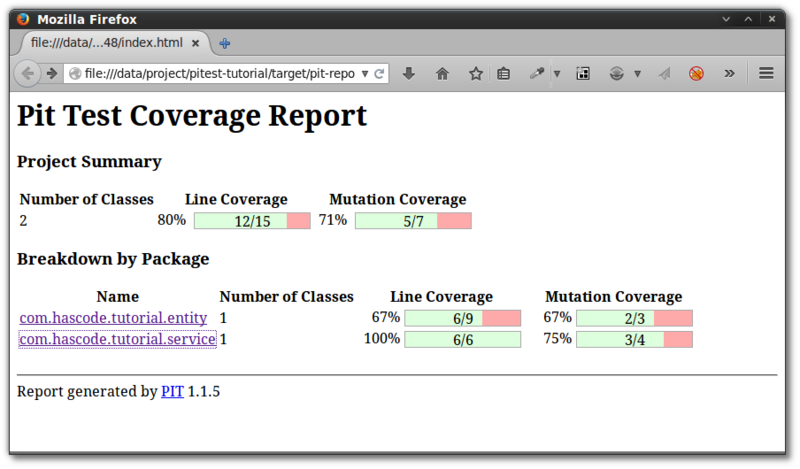 Running the “mvn org.pitest:pitest-maven:mutationCoverage” is not all that needs to be done. The project needs to have the mvn verify goal run to compile the class files. Then running the command line produces the tests. Again, this has pointed me in the direction I need to search. Thanks for the great article.